Oh, it is hot today. Even at the market, first thing in the morning, the temperature was rising what seemed like every few steps. You could see all the shoppers moving rapidly between the stalls to get back under the shady covers. 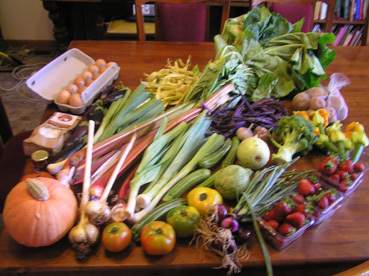 We moved quickly, too – beautiful through the veggies are at this time of year, it’s just too hot to linger. Today’s theme seemed to be ‘regulars’. I started by going to get some money from the market ATM, and the chap who runs the Showgrounds market mentioned to us that they were thinking of expanding the market a bit, and, as regulars, did we have any ideas about the sorts of stalls we would like to see represented? In fact, I have endless ideas, but I would love to see more fruit stalls and more ethically-raised chicken – we manage to coincide with the chicken lady maybe three times a year, which is not often enough! Hmm, now I think about it, I should have mentioned the Bedouin lady. Maybe she’ll find it herself? The raspberry man was there with his gigantic rhubarb again, as well as elephant garlic, something I have heard of but never seen. It does not appear to be made of actual elephants. He also had a lot of raspberry jams and sauces, but so far I have been able to resist. 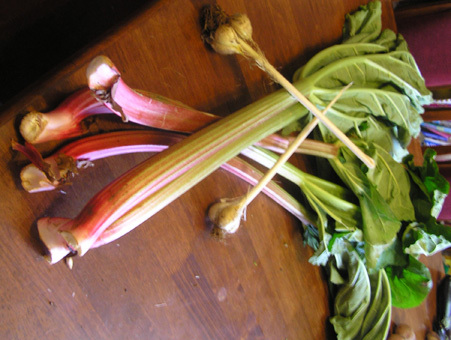 Yes, the rhubarb is just as big as last time. Elephant garlic contains no traces of elephant, but does appear to have tusks. Next, we went to visit my friendly Italian lady, along with what seemed like half the market. 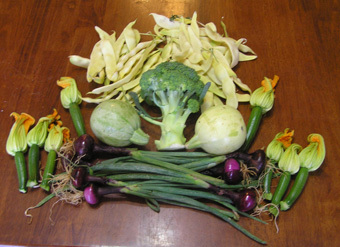 She had zucchini flowers again, which were not to be resisted, and tiny red salad onions, and that lovely broccoli. She also had giant yellow beans and the round zucchini which you stuff. I’m sort of in the mood for stuffing things (hmm, which reminds me, I must make that stale bread into breadcrumbs), and I’ve foolishly neglected my killer zucchini patch too long, so my round zucchini has shrivelled up and died. I got two of hers instead. Next door to her was a stallholder I hadn’t met before. Her specialties are cherries and chestnuts, neither of which are currently in season, but in between she sells all sorts of jams and preserves, and also things like chestnut flour. The Italian lady’s husband came over to the stall to say hello, and informed the new stallholder that she should treat us well, because we come every week (actually every fortnight, but never mind), and we are good people, very nice… And we had a chat about the market everyone had been at the day before, which had apparently been a less than successful event – hot weather, short tempers, and un-certified stallholders taking away people’s custom. This market, we were given to understand, is much nicer. 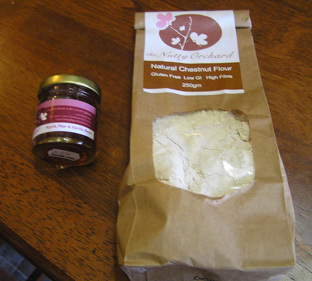 I bought some chestnut flour, which I will probably use to make castagnaccio, though I was told that it also makes an amazing tempura batter for zucchini flowers. I’m trying to imagine this, and may need to give it a try. I also got some apple and pear jelly, which had a beautifully cool vanilla flavour to it, and little black speckles of vanilla bean through it. We said hello to the Koallah people who didn’t have eggs today (and I still have plenty of meat from my order a couple of weeks ago), and passed on to the egg-man and thence to the walrus. OK, maybe not. 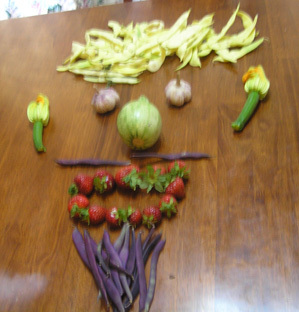 But Colourful Vegetable Man was there, with baby leeks, multicoloured tomatoes, deep purple beans and miniature pumpkins and eggplants. And stripey zucchini! I actually wound up going to his stall twice, because he really did have all the good stuff – on my first pass, I bought tomatoes and purple beans and striped zucchini, and told him about the yellow beans from the Italian lady, which meant that he then attempted to sell me the grean beans, too, so I could have the trifecta. I love how purple those beans are! And the colours of everything at this stall – all those tomatoes are ripe, you know. Then, when I realised I had change left after visiting the potato man’s stall, I went back for pumpkin and leeks and baby eggplant in strange shapes and conformations. I expressed glee at the odd little eggplants and the stall holder told me there was one that made him think of me when he was packing things up that morning. Was it this one? I asked. 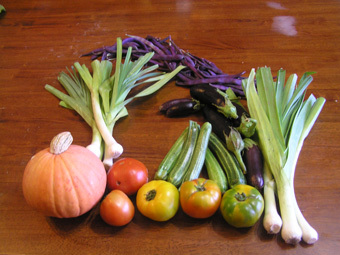 And then I came home to put away my vegetables and photograph them artistically. Andrew claims that he is not responsible for the following pictures. Even though he took one of them. However, I do have to point out that all I said was “Hmm, better photograph the veggies,” and Andrew said “Ooh, more food art!”, and then started commenting on the vegetable faces I did a few weeks ago. And then he said that the rhubarb would make good legs, and of course the yellow beans were always going to make wild hair, and the next thing we knew I was asking Andrew for anatomical drawings so that I could give Veg-man internal organs. Veg-man needs to be anatomically correct, after all. Admittedly, he only has pumpkin heart, leek lungs, a broccoli liver, an elephant garlic spinal column, and tomato and potato intestines (I should have bought sausages), but still. And he’s definitely a boy Veg-man, too. 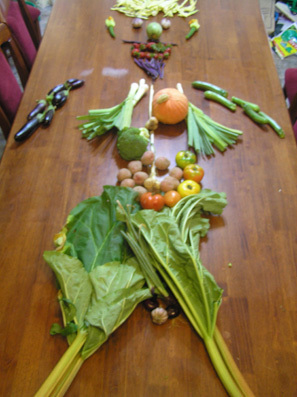 Veg-man is not quite anatomically correct, but at least he has a heart and lungs. Season 2 episode 1 of Great British Food Revival has Clarissa Dickson-Wright on Garlic, including elephant Garlic. It was used in one of her three recipes, and this should be findable on the BBC website. Don’t be tempted to to go to the book depository to see if both volumes of the recipe books for the series are available at 9% off with free shipping…. Yes, you can stop helping now. I’ll be interested to know what you think of Elephant Garlic, when you try it.